Marie Kondo is probably both. The trend, organizing, will continue because people are recognizing the value. The fad, her strict rules (quite a few) and methods, may or may not last. Ms. Kondo did not reinvent the wheel, but she achieved the highest levels of success as a Japanese woman who transcends boundaries. Her KonMari Method differs stylistically quite a lot but generally is similar to that of most pro organizers. 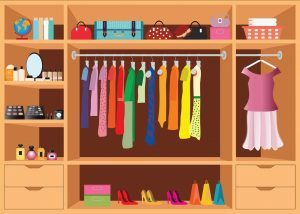 As a pro organizer, I wanted to see what the hype was about so I read her book The Life-Changing Magic of Tidying Up. Throughout, Ms. Kondo anthropomorphized (giving feelings to inanimate objects), apparently because she lacked recognition and attention from her family. The KonMari Method must be followed in this order, one category at a time: clothes, books, papers, komono (Japanese word for miscellany) and mementos. No exceptions. To start, “Place every item of clothing in the house on the floor.” She means everything—except what’s in the laundry. Any missed items automatically go in the discard pile. Upon entering her clients’ homes, she kneels on the floor, silently greets it, introduces herself, asks it for help to create an enjoyable space and bows. Hold each item and ask if it sparks joy; if not, it should be thanked for its service before being discarded. Having difficulty parting with things that don’t spark joy reflects an attachment to the past or a fear of the future, or a combination of both. Ms. Kondo insists the entire house be decluttered at one time or people lose interest in the process. I’d love to know how she accomplishes this. Decluttering and organizing a house take MANY, MANY hours and people can only work so many hours at a time and so many days per week. An Organized Approach (and professional organizers generally) assesses clients’ goals, creates customized systems and works one-on-one with them while teaching how to declutter, organize and maintain the results. All of this must work with each client’s personality, ability, needs, limitations and timeframe. What do we have in common? We love what we do!